Habitat : It is a common weed distributed throughout tropical and sub-tropical india and ceylon in waste places and jungles upto an altitude of 1050 m.
Uses : The plant is aphrodisiac, analgesic, anti-inflammatory and tonic in nature. It effects on central nervous system and provides relief from anxiety. It is used to reduce the body weight. It lowers the blood pressure and improves cardiac irregularity. It is useful in fevers, fits, ophthalmia, rheumatism, leucorrhoea, micturition, gonorrhoea, colic, nervous disorders and general debility. The root juice is used for the healing of wound. 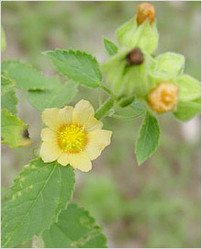 Whole plant juice is used in spermatorrhoea. Plant bark is effective in curing facial paralysis and sciatica. It is also used to improve sexual strength. The oils are used topically to the sore muscles, sore joints in arthritis and rheumatism, in sciatica and neuritis of legs. It is diaphoretic in nature and increases perspiration and thus reduces fever.